Chinese Poetry in Times of Mind, Mayhem and Money. Leiden: Brill, 2008. 518 + xviii pp. Preface, Acknowledgements, Conventions, Illustrations, Bibliography, Index and Glossary. With the assault on print culture in full force and publishers feeling the tautness of the bottom line far more now than ever, the admonition to scholars is to write books that are shorter, shorter, and, once again, shorter. Books of 90,000 words are now the norm and ones of 65,000 are becoming increasingly common. Long books are eschewed by publishers, and it is now only works that are considered true masterworks that are provided the latitude to fully explore their subject in all its minutiae. But the price ultimately reflects the human labor and material expense that such books incur. 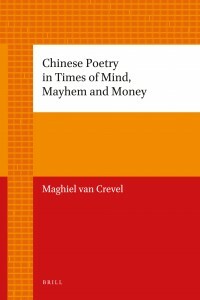 Maghiel van Crevel’s Chinese Poetry in Times of Mind, Mayhem and Money, published by the venerable Dutch firm Brill, is one such masterwork. And although the cloth version is by no means cheap, Brill has just (2011) generously issued a paperback version at the price of $49.50, rather modest considering the length of the work (474 pages of text and 29 pages of bibliography) and the pivotal consequence of its contribution. But a book cannot be judged by length alone, even if a cover-to-cover reading of this one is as exhaustive of its subject as it is exhausting to its reader, given the veritable ocean of granular detail it contains. In terms of the command of subject matter, the breadth of the discussion, the expanse of time covered, the knowledge the author exhibits of the Chinese-language secondary scholarship, and his intimate familiarity with the original publishing circumstances of myriad specific poems in obscure journals scattered throughout China, let alone their reprinting in books and anthologies, Van Crevel’s contribution is arguably unparalleled in English-language contemporary Chinese cultural studies. Reading Chinese Literature in Times of Mind, Mayhem and Money is akin to taking a graduate seminar on the subject. If one were to commit to memory all the points on various levels–close readings of individual poems, insights into biographical background, assessments of the critical perspectives of others–that the author makes, then one would have a comprehensive knowledge of contemporary Chinese poetry from the mid 1980s to the middle part of the first decade of the 2000s. If one were to pair a reading of this book with Van Crevel’s previous one, Language Shattered: Contemporary Chinese Poetry and Duoduo, then that comprehension could be extended back almost another decade. On the back cover, Michel Hockx goes so far as to characterize Van Crevel as “the world’s leading expert on contemporary Chinese poetry.” I try to avoid such absolutes, and I return to this assertion at the end of the review, but for now I think we have to acknowledge that Van Crevel has certainly produced as complete a picture in English as any scholar of Chinese poetry in the contemporary era, and more complete than most. The worth of Mind, Mayhem and Money certainly also extends beyond the length of the treatment, the detail involved, and the all-encompassing quality. By virtue of the fact that he evidently has lived this era intimately, poured over the poems, collected the obscure journals, ruminated with the authors, and thought through the theoretical issues, Van Crevel’s work offers interpretations with which the reader is hard put to quibble. I found myself time and again essentially agreeing with his conclusions on specific poems. Mind, Mayhem and Money comprises thirteen chapters, including an expansive introduction (Chapter One), eight “case studies” of particular authors (Chapters Two through Nine), three chapters on “metatextual” matters (Chapters Ten through Twelve), and a “coda” (Chapter Thirteen). Van Crevel frames his overarching argument in some key ways that include quickly dispensing with “official” literature in favor the avant-garde, maintaining a running dialogue throughout the book on the tensions between the “elevated” and “earthly” poles of contemporary avant-garde poetry, and focusing on the three realms of text (the poems themselves), context (literary history and biography), and metatext (discussions about poetry). He highlights the work of about eleven contemporary poets and references the work of about a dozen others, many substantively. When we boil the work down to the particular poems dissected, we have about seventy close readings of many of the representative works of the past twenty-five years. Of course, in spite of the volume of this work, no book can fully encapsulate the total picture of such a vibrant period. What Van Crevel does articulate is that this indeed was a crucial period in Chinese history–not just in fiction, film, theatre and fine arts, as others have shown–but also for traditional China’s crowning genre now freshly recast in avant-garde form. With a couple notable exceptions such as Huang Xiang and Shi Zhi, poetry from 1980 to the present is overwhelmingly more important than that of the immediately preceding thirty years. Still, Van Crevel fully acknowledges his own limits and credits others coming after him, some his own students and some the students of others, who are carving out niches for their own research that include such topics as the internet as a medium for poetry and women’s poetry, a topic to which Van Crevel admits he does not devote adequate attention. The first chapter sets the stage for the rest of the book. In it, Van Crevel discusses the meaning of such notions as “official,” “unofficial,” and “avant-garde.” He also defines what he means by the three broad categories of “mind,” “mayhem,” and “money.” The terms “unofficial” and “avant-garde,” according to Van Crevel, are not easily teased apart, and in fact overlap extensively. However, what they designate are basically different ways of cutting the same pie, with the former term generally referring to institutional distinctions and the latter indicating the aesthetic dimension. As the Reform Era gained strength through the 1980s, the notion of “official” literary mechanisms increasingly accrued a tincture of disapprobation. Nevertheless, many poets who would consider themselves avant-garde continued to publish in institutionally sponsored and financed official journals. The term “unofficial” refers to the domain outside the state administered publishing industry, a realm in which intellectuals only surreptitiously dwelt during the Cultural Revolution, coming above ground starting in 1978. By the height of the 1980s, it had expanded geographically throughout the country. Several features of the unofficial realm are important: there was no attempt to control its readership; it consisted of informal networks of poets and critics; it rejected cultural policy; and it organized literary events and other activities. The avant-garde was best defined negatively as those engaged in work that dissociated itself from the orthodoxy. Van Crevel notes that it is important to distinguish between avant-garde fiction and avant-garde poetry, as the two actually had little interaction. I found this point interesting, since it indicates that as early as the mid-1980s in China, the literary scene already was becoming highly complex and populated with a clear division of labor running along genre lines emerging. But even within the poetic avant-garde, Van Crevel continues, tremendous diversity exists. And it is within the field of the avant-garde that we find the main bifurcation between the most influential poets in contemporary China – the division between “elevated” and “earthly.” The “elevated” and “earthly” distinction runs throughout the avant-garde period, beginning with the anti-Obscure poet Han Dong, known for his colloquial poetry, and proceeding through the major literary battle of the past decade between the “Scholarly” and the “Popular” poets. Van Crevel’s historical demarcation, which he stresses should not be seen as a procrustean scaffolding imposed on the era, consists of these three fundamental moments: that of the “mind” – the upbeat atmosphere during the Reform Era up to 1989; that of “mayhem” – the June Fourth aftermath, a catalyst for more interior and contemplative work when questioning the violence and repression of the government was still taboo; and that of “money” – China of the late 1990s and beyond, when consumerism, entertainment, new forms of media, commercialization, popular culture, and “moneyfication” took over. Despite these broad historical categories, even Van Crevel confesses that “a summary in three words and two decades – mind, mayhem and money, and “the Eighties,” “the Nineties,” and beyond – does no justice to the complex dynamics of the social, political and cultural context of contemporary Chinese poetry” (185). The “case study” chapters that constitute the bulk of the book are intricate mixtures of literary history and biography mixed with close readings of important poems by each author. In some cases, such as Chapter Three on Haizi, Van Crevel deals extensively and adeptly with the representation of the given poet in scholarly and other writings. But he always eventually offers his own readings of the poet’s work. Two poets in his book receive far more attention than the others, and Van Crevel suggests they are the most prominent and influential poets of the era: Xi Chuan and Yu Jian. An intriguing feature of Van Crevel’s project is that he shows these poets in different dimensions at different points in his book, and in some cases they exhibit similar tendencies. Generally, though, they are considered to represent the two opposite poles of “elevated” and “earthly” poetry. Xi Chuan is particularly remarkable as the “survivor” poet who outlasted his close friends Haizi (who committed suicide three months before June 4th) and Luo Yihe (who died of a brain hemorrhage in May 1989) and went on to become one of the most influential poets in the country. His work is complex and in some cases “indeterminate” (a concept Van Crevel adopts from Marjorie Perloff). Xi Chuan also has produced a significant oeuvre of metatextual works. Van Crevel thus deems fit to spend three different chapters discussing his work. Yu Jian is in some ways the counterpoint to Xi Chuan, known for his more low-key style, sense of humor, “quotidianism,” and objectification of human experience. He also figures prominently in three of Van Crevel’s chapters. Perhaps ironically, or at least somewhat unexpectedly, one chapter is devoted to both of these authors. This chapter, number six, does not dwell on the differences between the two, but rather emphasizes the way both approach the tensions between verse and prose. Characterizing some of their work as “fringe poetry,” Van Crevel sees them as working hard to create work that is narrative in most senses of the term but still not prose. Van Crevel provides important historical context, noting that post-Mao poetry at its beginnings was more content-driven than formalistic, but he is also at equal pains to indicate that there are identifiably prosodic qualities to their narrative poetic works as well. Other poets, such as Sun Wenbo, also seek to create a rhythmic new sub-genre of narrative poetry in China. In his case, this is achieved through the use of repetition and enjambment. Van Crevel sees this narrative trend in poetry as a result of the “content bias” placed on poetry. Traditionally, poets were expected to take on social responsibility and create work that was politically engaged. Combining that with the modern era in China, during which social upheaval has been the norm, Van Crevel argues that there has been tremendous pressure on poets to forge works in which meaning is considered hierarchically superior to form. But Van Crevel interestingly argues that with these contemporary narrative masters, the hierarchy has withered away and meaning and form are more tightly entwined. I would add that traditional Chinese verse forms are obviously no longer salvageable in contemporary China, and Western ones were proven during the Republican era to be basically ill-suited to the Chinese language. This whole discussion might give the indication that Van Crevel has moved well beyond the “Misty” or “Obscure” poets who first overturned the literary orthodoxy in 1978. Actually, though, Van Crevel devotes one chapter to poets in exile and in it highlights the work of the Obscure poets Bei Dao and Yang Lian, as well as Wang Jiaxin–a “second generation” poet (my characterization, since Van Crevel avoids the use of the “generational” prism). In this chapter, Van Crevel does an admirable job of using the works of the three to contrast their experiences and attitudes in exile. He also combats the impulse held in China at the time to dismiss their works as efforts to cater to the West. In Chapter Nine, the last that focuses on (poetic) “text,” Van Crevel examines the more recent trends of “Lower Body” poetry in the work of Yin Lichuan and Shen Haobo, giving examples of their desublimated imagery (often grotesque, offensive, and unruly). He ultimately shows how, historically speaking, the two, and others in their cohort, are actually the latest incarnation of the “earthly” tendency that began with the first salvos against the Obscure Poets hurled by Han Dong two decades prior. The book finishes with discussions of poetry by several of the prominent exponents of the “elevated” and “earthly” poles–Xi Chuan, Han Dong, Yu Jian and Cheng Guangwei – which culminated in the 1998-2000 polemic between the two camps. Van Crevel provides a thumbnail discussion of the prominent points followed by a comprehensive and chronological listing of essays. His final chapter is slight and tentative, naturally so, since it is dealing with the most recent trends, especially the performance poetry and event culture of the past few years embodied by the work of Yan Jun. This book is an outstanding study and represents the sustained work of Maghiel van Crevel’s entire adult life. I have little critical to say about it. However, let me suggest two things in the book, one thematic and one structural (or mechanical), that might have improved it slightly. First, I am not particularly enamored of the term “avant-garde” to depict contemporary Chinese poetry. The scholar is hampered by the fact that the Chinese term xianfeng is uniformly used in China exactly the way Van Crevel uses it. But since “orthodox” poetry has been so resolutely debunked and marginalized by the independent intellectuals who reside in the now dominant “unofficial” sphere, repositioning the cultural compass of contemporary China so much so that “orthodoxy” has been rendered completely irrelevant, can we credibly state that “avant-garde” retains any of its essential meaning? I could see how the poetry of Yin Lichuan and Shen Haobo, for example, might still be considered avant-garde, because it offends and makes a large sector of the reading public, across camps, cringe. There seems to be a crucial sense in which avant-garde ceases to signify something once it becomes the dominant and pervasive norm. Could, then,xianfeng mean something else? And how might we term it? Secondly, on the level of structure or mechanics, the book could have been improved in one fundamental way: including all Chinese poems cited in their original as well as translated form. This would be impractical for the longest of poems. However, if one simply uses the rule of “if the author translates it, the original should appear side-by-side,” then it would be feasible to do so. As is, the fact that one must go searching for the original Chinese poems is cumbersome. Having said that, I believe there is a practical solution to this omission. Since Van Crevel already has utilized the MCLC Resource Center for publications and postings in the past, it would appear to be a likely venue to host a supplement volume to Van Crevel’s main text that contains all the original Chinese poems cited in his book. This would be particularly helpful since many of the poems are not easily obtained, having, as Van Crevel illustrates, not been published in the official organs. Many have been subsequently reprinted, but not all. I already have indicated that this book is a must read for all interested in contemporary Chinese culture. It should be a companion to graduate seminars. The supplement would ensure that. Finally, to return to the issue of the book’s impact and the stature of the author. Indeed, this book solidifies Van Crevel’s place as the preeminent scholar of contemporary Chinese poetry writing in the West. This recognition, nevertheless, needs to be tempered by placing him in some context with his colleagues in the field. Michelle Yeh’s work, for example, is particularly good at transcending epoch and demonstrating how poetic features function in early modern China, Taiwan, Hong Kong, and the PRC. Some others–Lloyd Haft, Dian Li, Dominic Cheung, Gregory Lee, etc.–have been especially good at focusing on a single poet and providing a thorough and exhaustive discussion of their work. Still others, such as Julia Lin, Andrea Lingenfelter, and Heather Inwood, have worked on or are working on women poets to an extent that Van Crevel does not. Michael Day and Michel Hockx have probably spent more time than Van Crevel on the “exploding” subgenre of internet poetry, if we could actually call it that. And of course there are several important scholars whose primary contribution is translation. I believe Van Crevel would agree with this general caveat to installing him as the chief regent of Chinese avant-garde poetry in the West. But certainly, if one were to read only one book on the current period, this would be it.